Our Honey Roasted Peanuts are an old time favorite. 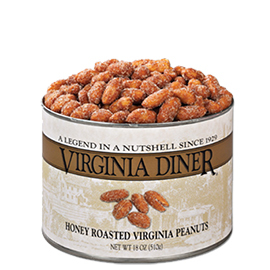 Extra Large Virginia Peanuts are blanched then cooked with light amber honey, sugar and salt for the perfect honey roasted peanut. A little sweet and a little salty... classically irresistible. Without a doubt, these are the best honey-roasted peanuts I have ever had the pleasure to munch on! Diet be damned! Love these honey roasted nuts!!!! A great snack that's hard to put down. We have been fans of your products for many years. Top quality and great service. We used to live in VA but Moved to CA in 2009. We love VA peanuts. We used to buy them but since moving here he only time we get to eat them is during the holidays when friends and relatives send it to us as gifts. We love the taste of the honey roasted peanuts. It is absolutely delicious. We could finish a can in one sitting. originally, I was gifted one of your products. It was really good, so I, not only ordered for myself again but felt family members, friends, and business partners would also enjoy. Christmas was the perfect time to share your great product. 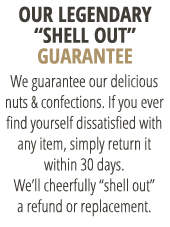 My husband loves the butter roasted nuts , but they need to be offered in larger container. 18 oz. doesn't last long! My favorites are salt and pepper peanuts. YUM! These nuts are the absolute best peanuts ever. Just wish they came in larger containers. I have purchased the honey roasted peanuts before. Love them! We order these peanuts for all our West Coast friends every year. Little nuggets of Virginia deliciousness.